When the clocks changed last year, our partners at ZEISS Vision Care UK convinced us to offer a special promotion on their DriveSafe lenses which had recently been launched. This offer was so popular, we are delighted to be able to repeat it again this year. Absolutely ideal for all spectacle wearers who drive and live in the Highlands - theDriveSafe lenses from ZEISS. The best feature of the lenses is perhaps that they have been designed to be worn all the time - they do not compromise any non-driving visual tasks such as reading, computer or tablet use, watching TV, cooking or outdoor pursuits. This is why we believe they are perfect for the Highlands - better vision for driving, but equally good at everything else. Particularly useful during the long winter months when the sun is very low in the sky - most commuting drivers will also be doing at least some of their journeys in full darkness. 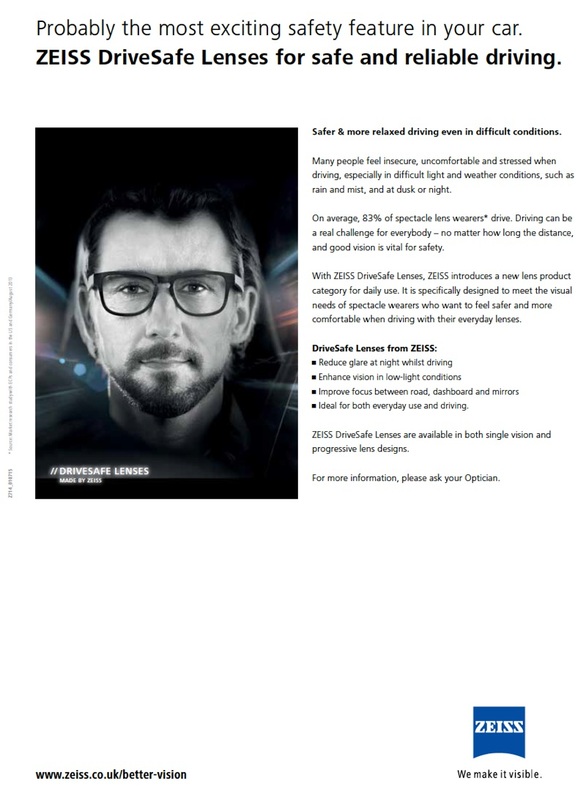 ZEISS DriveSafe Lenses are currently available on promotion with 30% OFF until the 31st December 2018 so there has never been a better time to upgrade. They are available in all three branches - Inverness, Dingwall and Golspie - call us as soon as possible to book and experience these fantastic lenses at a great price.